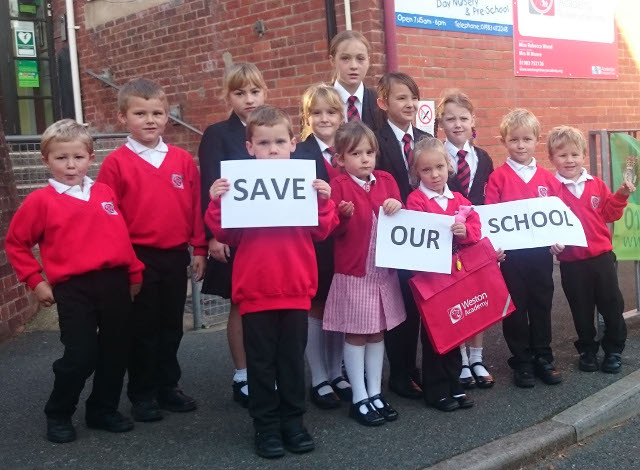 Members of the Weston Academy Action Group have been examining the AET contract and digging back through paperwork to build what they say is a robust defence against closure. WAAG are now publicly challenging Academies Enterprise Trust (AET) over figures tabled in spring based on a forecast that shows a steady increase in pupil numbers, conflicting with an “unreleased forecast” with numbers being used to justify the closure (numbers reducing to 40 by 2017). In addition WAAG has scrutinised AET’s contract with the Secretary of State for the provision of education to Weston Academy. The contract includes a termination clause (5), which stipulates processes including notification by 28th of February in the year PRIOR to a “critical year” in the school’s future OR in the case of special measures an application to include full details of consultation with stakeholders. The first bullet point would imply closure in July of the critical year. The latter bullet point is invalidated by no consultation. Closure at Christmas is not an option, but the date of 31st of December on the closure letter, fits with AET financial milestones. The prime reason for closure, “numbers reducing to 40 by 2017” is not justified and is in conflict with a forecast discussed at earlier governors’ meetings, which shows numbers increasing; including a feed from a co-located nursery into reception class. The governing body was dissolved by AET, not DfE, in June 2015 and replaced by an AET imposed Interim Management Board, tasked to turn the school around which has not met since July, despite the run up to the proposed closure. Does this imply prior intention? On 22nd of September this board were told of the decision. How dare AET judge our management when they have been the “subject of a financial investigation” by the Education Funding Agency in during 2015 and also the “subject of a pre-termination warning notice letter” from DfE in 2014. We also note that the interim management board put in by AET to replace the governors, that has not met since July, and was inquorate at a meeting scheduled for Monday 12th October. WAAG are keen to stress that we have a multi-faceted robust defence against the closure of our school, whilst we also have exceptional gratitude to the National Secular Society for their continuing assistance. The matter of non-faith is merely part of the overall defence, that has deeper national implications for any academy school and the wider community. 3 Comments on "AET challenged by action group over planned closure of Weston Academy"
Looks like WAAG is right on the ball here and AET a shambles. What a mess our education system has become since central government started to take it away from local government. The non-faith issue is also important IMO: keep the religions out of education and develop free-thinking minds. Well done and Good Luck. Yes, an attempt to head off any protest group at the pass.